Enhanced -Medical Rehabilitation (E-MR) can be the solution to the ongoing challenge of client motivation and participation in occupational therapy! 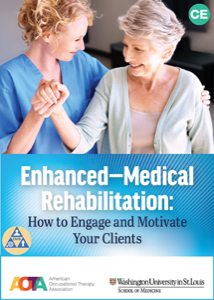 Enhanced -Medical Rehabilitation (E-MR) is a structured approach to applying the science of behavior change and the principles of rehabilitation intensity to clients' occupational therapy program. By using occupation centered goals determined by the client, this approach has been shown to increase interest in rehabilitation leading to a higher level of involvement in the experience and thus achieving better therapy results. This approach is based on research within rehabilitation settings, particularly observations of anxiety and depression in older adults and how therapists might motivate these clients in therapy sessions. Applying the recommended strategies ensures that clients understand and value occupational therapy as the means to help them return home to participate in activities that are important to them. Practitioners who complete this course by successfully passing the exam are also eligible for the free digital badge that will let others know about the E—MR knowledge and skills that you possess. 1) Describe the scientific literature and theory grounding the evidence based E-MR approach. 4) Discuss principles of OT E-MR for use in medically impaired older adults.